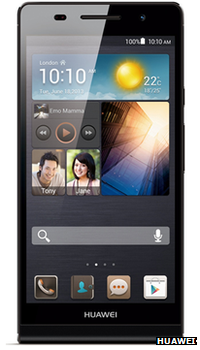 The Android-based Ascend P6 is 6.18mm (0.24in) thick and is also unusual in that it has a 5 megapixel front camera for "high quality" self-portraits. The Chinese firm has said it expects the handset to do "miracles" for its brand. One analyst praised its design, comparing it to a "steamrollered iPhone", but said its lack of support for 4G networks might limit sales. "It's undoubtedly the most impressive phone that Huawei have launched to date in terms of the design, the materials used and its quality," said Ben Wood, director of research at consultancy CCS Insight, who was at the London launch. "We've seen mainland Chinese manufacturers rapidly improve their ability to make competitive devices over the last 18 months and this is possibly the best so far. But its 3G status means there has undoubtedly been a trade-off to get it as thin and cheap as possible." Huawei says it designed one of the slimmest and narrowest circuit boards in the industry to squeeze the electronics into the new handset. The device has a 4.7in screen making it comparable to the HTC One but is more than 3mm (0.1in) thinner. It is also slightly slimmer than both the iPhone 5 and the Alcatel One Idol Ultra - which previously claimed to be the world's thinnest - but at 120g (0.26lb) weighs a little more than both. The phone features Huawei's own tile-based user interface called Emotion and proprietary software, including an "auto-facial enhancement" tool designed to make self-portraits look better. Various power saving technologies based on the firm's experience as one of the biggest telecoms equipment makers. As a result, it says the device's battery lasts 30% longer than it would do otherwise. Huawei is already a well known brand in China where it grew to become the country's biggest maker of telecoms equipment after being founded in 1987. Its more recent shift into Android phones has also found success. According to data research firm IDC it shipped 9.9 million smartphones in the first three months of the year making it fourth biggest vendor after Samsung, Apple and LG. However, the firm acknowledges it still needs to do more to make western consumers familiar with its name and has committed 2% of its revenues to try to ensure it is widely recognised as a leading smart device brand within five years. "Seven years ago nobody would have believed Apple could be so successful, and maybe five years ago that Samsung could be so successful," Shao Yang, chief marketing officer for Huawei Device, told the BBC. According to a recent study by at Strategy Analytics, Samsung accounts for about 95% of all profits in the Android smartphone market, thanks to "an efficient supply chain, sleek products and crisp marketing". That has led some analysts to question the wisdom of competing directly against the South Korean firm. But Mr Wood suggested Huawei might be able to make headway thanks to the economies of scale offered by its rapid rise in its homeland. "This year Huawei is expected to sell 60 million units - double what it did last year - with the lion's share of that coming from China," he said. "So, when competing with companies like Sony or Nokia it has an inherent advantage which will help with cost. "It has to make the most of that as it has to pay a kind of tax in the west: since its name is less well known, for big operators or retailers to take its products they expect to get them at a lower price feature-for-feature, spec-for-spec than from a recognised brand."